Language: Amharic is the working language of the federal government, while Oromiffa and Tigrigna are widely spoken. English is taught in schools and is the main business language. Working hours: Ethiopia is GMT+3. Government office hours are 8:30 am – 12:30 pm and 1:30 pm – 5:30 pm from Monday through Thursday; and 8:30 am to 11:30 and 1:30 pm to 5:30 pm on Fridays. Ethiopia, five times the size of the United Kingdom, is strategically located in the Horn of Africa. Its proximity to the Middle East and Europe, together with its easy access to the major ports of the region, enhances its international trade. 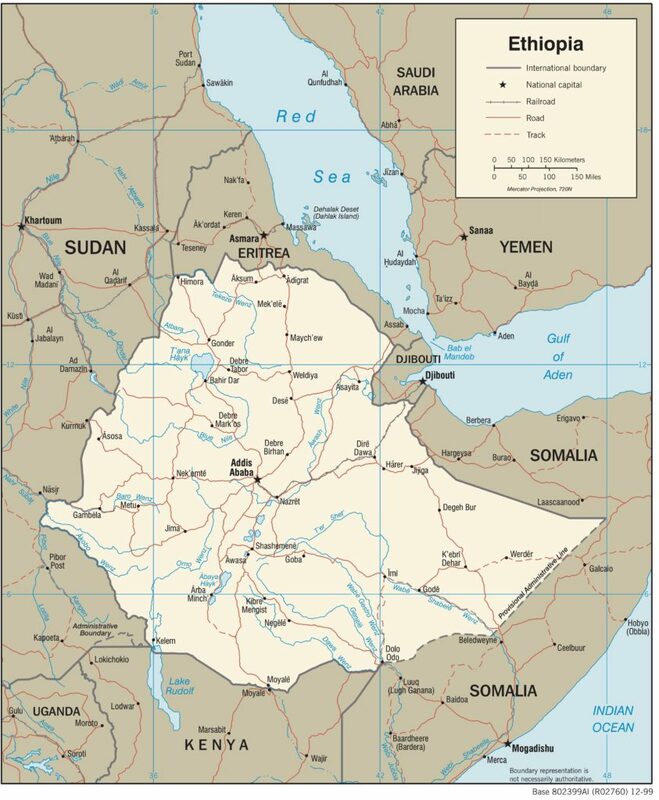 Covering an area of approximately 1.14 million square kilometers (444,000 square mile), Ethiopia is bordered by the Sudan on the west, Somalia on the south-east, Djibouti on the east, Eritrea on the north and Kenya on the south. Although Ethiopia lies within 15 degrees north of the equator, owing to the moderating influence of high altitude, the central highlands, where the vast majority of Ethiopian peoples live, generally enjoy temperate and pleasant climate, with average temperatures rarely exceeding 20 degree centigrade. The sparsely populated low lands, on the other hand, typically have sub-tropical and tropical climates. At approximately 850mm (34 inches), the average annual rainfall for the whole country is considered to be moderate by global standards. In most of the highlands, rainfall occurs in two distinct seasons: the “small” rains during February and March and the “high rains from June to September. Ethiopia is the only African country which was not colonized by European colonial forces. It was briefly occupied by the Italians between 1936 and 1941. The history of Ethiopia, known to many as Abyssinia, is rich, ancient, and still in part unknown. Anthropologists believe that East Africa’s Great Rift Valley is the site of the origin of humankind. The first recorded account of the region dates back to almost 5,000 years ago during the time of the Egyptian pharaohs, when the ancient Egyptians sent expeditions down the Red Sea in quest of gold, ivory, incense, and slaves. It is in the Afar region of Ethiopia where scientists discovered the remains of “Lucy” or Dinkenesh, meaning, “thou art wonderful,” as she is known to the Ethiopians. “Lucy” lived more than three million years ago, and her bones now rest in the Ethiopian National Museum. The country’s rich history is woven with legends of King Solomon and Queen of Sheba; the Ark of the Covenant that is said to rest in Axum; the great Axumite kingdom and the birth of Christianity; the rise of Islam; and the story of King Lalibela, who is believed to have had constructed eleven rock-hewn churches, still standing today and considered the eighth wonder of the world. In recent history, between 1889 and 1913 Emperor Menelik II reigned, fending off the encroachments of European powers. Italy posed the greatest threat, having begun to colonize part of what would become its future colony of Eritrea in the mid 1880s. In 1896, Ethiopia defeated Italy at the Battle of Adwa, which was considered the first victory of any African nation over a European colonial power. Menelik’s successor, Haile Selassie I (reigned 1930-74) was left with the task of dealing Italy’s resurgent expansionism. In the early years of World War II, after a brief occupation Ethiopia was liberated from the Italians by the joint forces of the Resistance Movement and British army. After being restored to power, Emperor Haile Selassie attempted to implement reforms and modernize the state. However, increasing internal pressures, including conflict with Eritrea and severe famine placed strains on Ethiopian society that contributed in a large part to the 1974 military rebellion that ended the Haile Selassie regime. The biggest impact of the coup d’etat was the emergence of Lieutenant Colonel Mengistu Haile Mariam as head of state, and the reorientation of the government and national economy from capitalism to Marxism. During the 17 years of the military control, the economy deeply worsened, while civil unrest grew beyond the control of the military. Growing civil unrest and a unified force of the Ethiopian people, led by the Ethiopian Peoples Revolutionary democratic Front (EPRDF) against their communist dictators finally led to the demise of the Mengistu regime in 1991. Between 1991 and 1995 the Transitional Government of Ethiopia, a coalition of 27 political and liberation organizations embarked on its path to transform Ethiopia from a centralized, military-controlled country to a free and democratic federation. In 1994, a new constitution was written, setting up a bicameral legislative branch and a judicial system, and guaranteeing equal right and freedom of expression to all citizens of Ethiopia. In May 1995 People’s Representatives to the Parliament were elected. Dr. Negasso Gidada was elected as the first President (Head of State) and the winning party – the Ethiopian Peoples’ Revolutionary Democratic Front (EPRDF) – designated Mr. Meles Zenawi as Prime Minister (Head of Government). In May 2000, a second multi-party election was held and the EPRDF, which won the majority of votes, nominated Mr. Meles Zenawi as Head of Government. In 2001, Mr. Girma Wolde-Giorgis was elected as the second President of the country. Ethiopia has nine administrative regions (States) and two special city administrations (Addis Ababa and Dire Dawa). States are delimited on the basis of the settlement patterns, language, identity and consent of the people concerned. With a population of about 78.2 million (2007/2008), Ethiopia represents a melting pot of ancient Middle Eastern and African cultures evident in the religious, ethnic and language composition of its Semitic, Cushitic, Omotic and Nilotic peoples. The Ethiopian peoples comprise about seventy-eight nationalities of which the Amhara and the Oromo constitute the majority, with about 60 percent of the total population. Approximately 85 percent of the population lives in the rural areas. The annual population growth rate is about 2.7 percent, and the economically active segment, between ages 14 and 60, is about 50 percent of the total population. Addis Ababa, the largest city, is the seat of the Federal Government of Ethiopia, and lies on the central plateau at an altitude of 2,400 meters, 9 degree north of the equator. Its average temperature is 16 degree Centigrade. Young as cities go; Addis Ababa was founded in 1887, and has a population of above 5 million. It is host to the African Union (AU), and the United Nations Economic Commission for Africa (ECA). Several other international organizations have their headquarters and branch offices in the capital, which is also the center of commerce and industry. Manufacturing plants for steel fabrication, wood, tanneries, textiles, cement, leather goods and breweries are among the activities located in and around Addis Ababa. Ethiopia’s other important cities of trade and industry are: Awassa, Dire Dawa, Gondar, Dessie, Nazareth, Jimma, Harar, Bahir Dar, Mekele, Debere Markos and Nekemte. All these towns are connected to Addis Ababa by asphalt and gravel roads, and most of them have good infrastructural facilities, such as first class hotels and airports. The Ethio-Djibouti railway connects Dire Dawa to the capital. The main religions in Ethiopia are Christianity and Islam. Ethiopia is a country with many nations and nationalities where many languages are spoken. Amharic is the official language of Ethiopia. The working languages of the national/regional government may differ according to regions. English, French, Italian and Arabic are also widely spoken. Ethiopia is three hours ahead of Greenwich Mean Time. The 12-hour clock is sometimes used locally and this can be confusing to visitors. The day starts with the sunrise i.e. the first cycle starts with “one O’clock” at 7 A.M. and goes on to “12 O’clock” at 6 P.M. The second cycle starts at 7 P.M. “one O’clock” and goes on to 6 A.M. “12 O’clock”. Ethiopia follows a slightly modified version of the Julian calendar, which consists of twelve months of thirty days each and a thirteenth month of five days (six days in a leap year). The calendar is eight years behind the Western (Gregorian) calendar from 11 September to 31 December and seven years in the rest of the year. The Ethiopian New Year is celebrated on the eleventh day of September. September 11, 2007 or 1 Meskerem 2000 (Ethiopian Calendar) marked the beginning of the Ethiopian third millennium.